Your FREE $10 refill credit will be automatically applied on the final page of checkout! 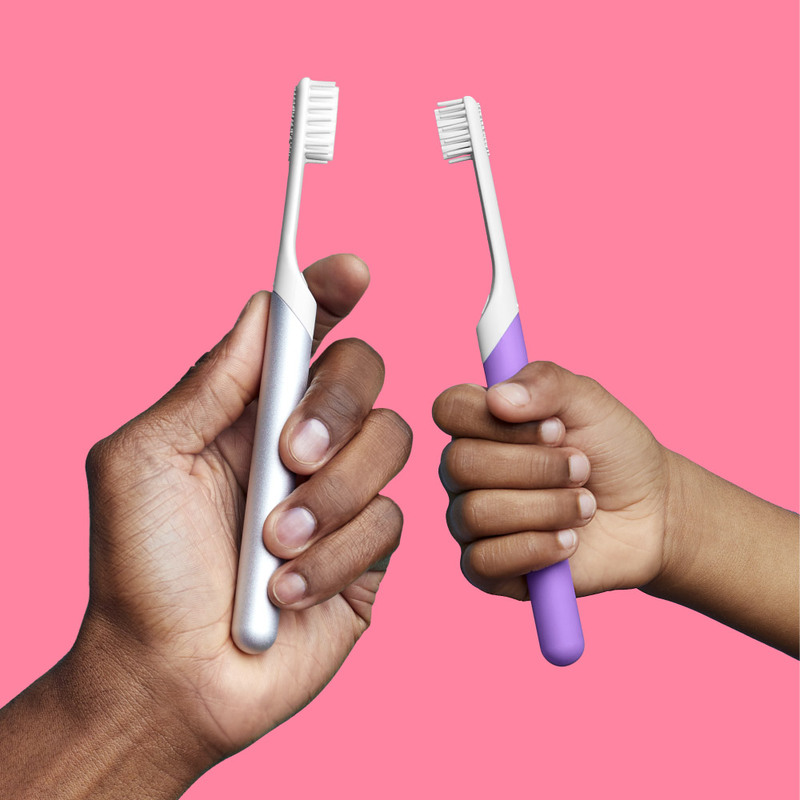 We brought dentists and kids together to design an electric toothbrush kids are actually proud to use. It’s just like our original, but tweaked to help young brushers develop a grown-up routine without childish gimmicks. Every 3 months, we deliver a fresh small brush head + battery ($5) and optional toothpaste ($5) with a lifetime warranty. Plus, you can cancel anytime. Small, flexible brush head includes 1,200 soft, round-tipped nylon bristles. Dentist-recommended for a gentle clean that won’t damage your teeth or sensitive gums. Lightweight, matte aluminum handle built with CNC precision, bead blasted by robots, and anodized for a lifetime of cleaning. Waterproof and shower-safe. Multi-use cover mounts to mirrors, stands on counters, and covers bristles for travel. Suction strip sticks and resticks to any clean, shiny, dry and flat surface if kept clean. Removable AAA battery lasts 3 months just like your brush head. A fresh battery is included free on a refill plan, or your own rechargeable battery works too. Long-lasting electric motor vibrates at an industry standard sensitive 15,000 RPM, pulses every 30 seconds for an even clean, and automatically stops after 2 minutes. Mint anticavity fluoride formula includes the active ingredient sodium monofluorophosphate 0.76% (0.1% w/v fluoride) with tooth-strengthening, anti-cavity properties. 3-month supply when you use a dentist-recommended pea-sized amount as illustrated on our portion guide (optional on a refill plan). Inactive ingredients: Calcium Carbonate, Sorbitol, Water, Sodium Lauryl Sulfate, Hydrated Silica, Sodium Carboxymethyl, Cellulose, Flavor, Sodium Silicate, Sodium Benzoate, Sodium Saccharin. To help you brush better, we offer automatic refill plans with fresh supplies delivered on a 3-month dentist-recommended schedule (before your bristles become worn out and ineffective). Subscribers can choose from a brush head with AAA battery and toothpaste. On a refill plan, you also get free shipping and a lifetime warranty on your quip. Your quip brush head and battery last 3 months, and that’s how often dentists recommend changing your brush head before it becomes worn out and ineffective. If you have had your brush for a while and need a fresh brush head and battery right away, choose “Now.” If you purchased your brush within the last two weeks, choose “3 months” to get your first refill delivered when you’re ready for a refresh. 1,200 soft DuPont nylon bristles inserted into 34 tufts to give each tooth a gentle cleaning. We do not and will not supply Medium or Hard (or “green”) bristles as they can be damaging to teeth and gums. Please consult with your dentist if you usually purchase medium or hard bristles. Flexible brush head helps clean tight spaces and keeps you from brushing too hard. Tongue scraper on back of brush head. Charge lasts 3 months on 1 regular AAA battery when used two minutes, twice a day (free with purchase and future refill packs). Also compatible with a rechargeable. Accepted by the American Dental Association. Proven to help prevent cavities. Mint anticavity fluoride formula. Includes the active ingredient Sodium Fluoride, 0.23% (0.12% w/v fluoride ion) with tooth-strengthening, anti-cavity properties, and xylitol, which is proven to help eliminate bacteria. 3-month supply (4.7 oz), large tube for home. 920 soft DuPont nylon bristles inserted into 22 tufts to give each tooth a gentle cleaning. We do not and will not supply Medium or Hard (or “green”) bristles as they can be damaging to teeth and gums. Please consult with your dentist if you usually purchase medium or hard bristles. Small, flexible brush head helps clean tight spaces and keeps you from brushing too hard. Tongue scraper on back of brush head. Watermelon anticavity fluoride formula. Includes the active ingredient Sodium Fluoride, 0.23% (0.12% w/v fluoride ion) with tooth-strengthening, anti-cavity properties, and xylitol, which is proven to help eliminate bacteria. Inactive ingredients: Water, Sorbitol, Hydrated Silica, Glycerin, Xylitol, Flavor, Cellulose Gum, Sodium Lauroyl Sarcosinate, Sodium Saccharin, Carrageenan, Titanium Dioxide, Hydrogen Peroxide, Menthol. Our brush head contains 920 soft, end rounded, DuPont nylon bristles inserted into 22 tufts to give each tooth a gentle but effective cleaning. We do not and will not supply Medium or Hard (or "green") bristles as they can be damaging to teeth and gums. Please consult with your dentist if you usually purchase medium or hard bristles. The electric motor vibrates the bristles at an industry standard 15,000 brush strokes per minute to provide a thorough yet sensitive cleaning action. The Motor pulses every 30 seconds to help you evenly clean your teeth and gums and cuts out at 2 minutes to let you know when to stop. Our motor runs on a rechargeable or replaceable AAA battery. The battery will last the same 3 months as your brush head. When replacing the brush head, you can simply slide out the battery and replace with a fully charged or fresh one (if you are on a refill plan we supply a fresh AAA every 3 months). Lightweight, easy-grip handle is slim and rubberized to help small hands gain better control and to endure a lifetime of cleaning. Waterproof and shower-safe. Travel cover mounts to any glossy surface after 5 seconds of firm pressure to keep your toothbrush neatly stored away from other surfaces and bacteria. The rear of the cover contains a suction strip that acts like a suction cup to allow the cover to attach and detach to any clean dry glossy surface such as mirror, glass or tiling. If storing in a shower, we recommend you do not stick it within the reach of the water. This product contains a subscription refill plan that sends you a refill pack when your credit card is billed on a recurring 3-month basis. The recurring payment is separate from your up-front payment and can be canceled at any time. There are never shipping costs for subscription items. 4.7oz full sized fluoride toothpaste provides 3 months' worth of brushing when you use a pea-sized amount each time. Our toothpaste is not tested on animals and is Vegan. With a year prepay plan, you pay for your first year upfront to get the best deal, and your supplies are mailed free every 3 months until 12 months’ time. At your 12 month refill point, you will revert to the regular solo plan of $10 every 3 months (or can cancel any time). We clocked in hundreds of hours of testing with families, hygienists, and pediatric dentists and learned something simple. Kids are inspired to brush better (and more often) with oral care that looks and feels like the products the adults in their life use. This is a grown-up toothbrush for me! My daughter asked to brush her teeth (instead of being reminded to do it). The perfect amount of vibration and the handle fits comfortably in hand without being too thick or thin. Young brushers need the same basic features as adults do for better oral health, just tailored to smaller mouths. So we made the small changes dentists recommend to give kids an extra hand with their everyday routine. Small teeth need a smaller brush head to get in every nook and cranny. 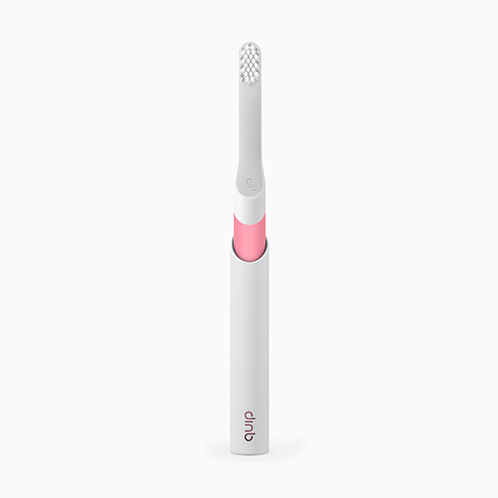 Gentle, timed sonic vibrations provide an effective clean while minimizing mess and toothpaste splatter. Slim, grown-up design with a rubber-grip plastic handle that gives small hands greater control. No wires or bulky charger. Charge lasts 3 months on a replaceable battery (free with refill). Many kids don’t like the tingle or flavor of mint, so we opted for watermelon instead. The fresh anticavity formula includes fluoride to strengthen enamel and xylitol to kill bacteria. On a refill plan, supplies for kids (and kids-at-heart) ship every 3 months, before brush heads become worn out and ineffective. It’s simpler shopping for every mouth under your roof. We promise to always put what is best for your teeth before all else. Our kids electric toothbrush and watermelon anticavity toothpaste meet the American Dental Association’s requirements for safety and efficacy of dental products. 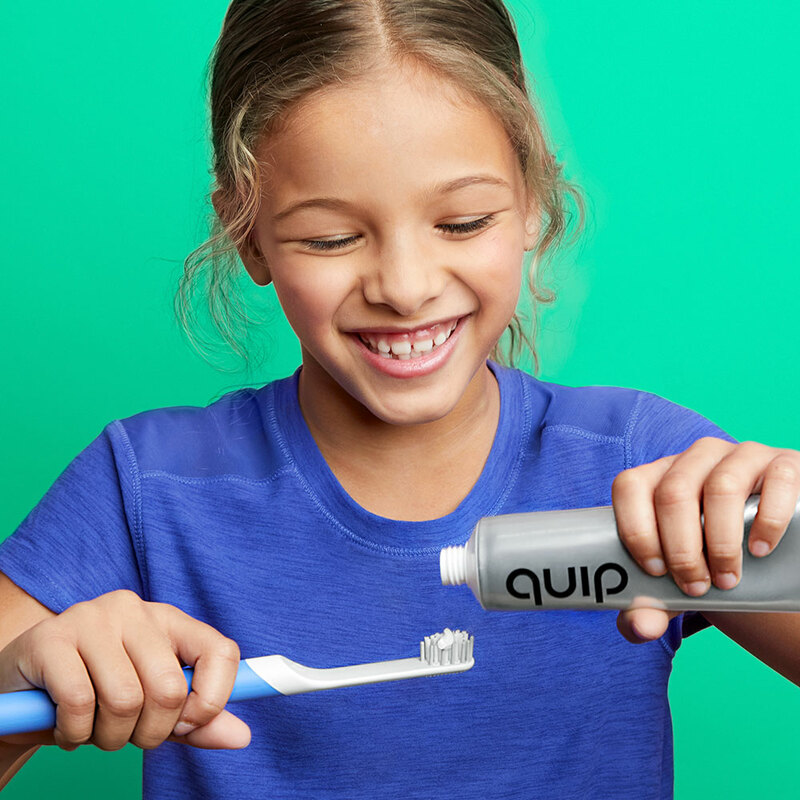 Can kids use the original quip electric toothbrush? Yes! The differences between the original and the kids plastic brush is a slightly smaller brush head with fewer bristles to make it easier to go tooth by tooth on smaller teeth, and a rubber-grip handle that's a little easier to grip. Both brushes are safe for kids and adults, so it really comes down to your personal preference. What ages is the quip kids electric toothbrush suitable for? 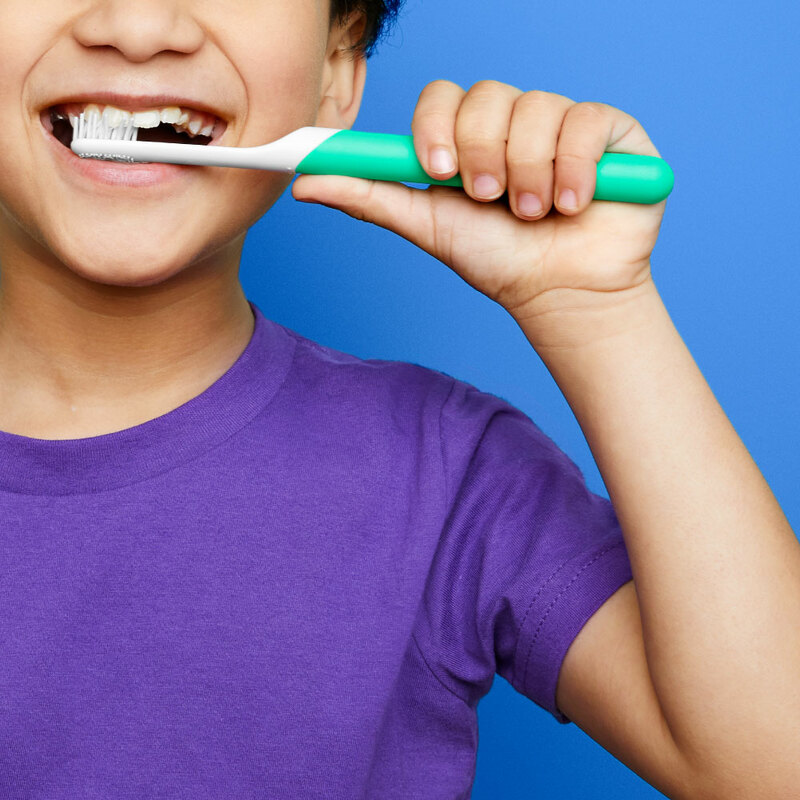 Kids can start using an electric toothbrush at age 3, with adult supervision recommended until age 8. Individual child preferences and professionals recommendations may apply. Electric toothbrushes have been shown to help disrupt the biofilm, spread paste, and help remove plaque effectively. As a parent, it’s essential to be part of this daily oral care routine, and to provide ongoing instructions and demonstrations as your child is building dexterity and proper brushing habits. Lead by example, and you’ll be one big brushing family in no time. What are the toothpaste ingredients? How much toothpaste should my child use? The American Dental Association recommends using a smear of toothpaste (no larger than a grain of rice) for kids ages 2 and under, and a pea-sized amount for ages 3 and older. How important are baby teeth? Won’t they just come out eventually? Baby teeth may be smaller in size, but that doesn't make them any less important. In fact, they help kids begin to chew solid foods, thereby supporting good nutrition. These teeth also help kids learn how to speak clearly, and they hold a place for the bigger permanent teeth to come in. By teaching kids healthy habits early, they can build a better oral health routine that lasts for life. Get health chatter, toothful tips and other tidbits you’ll actually want to chew on. Don’t worry — we promise not to clog your inbox.